Did you know that National Waiters Day celebrates the estimated 600,000 waiting and bar staff in the UK, and aims to inspire people about careers in the hospitality industry. 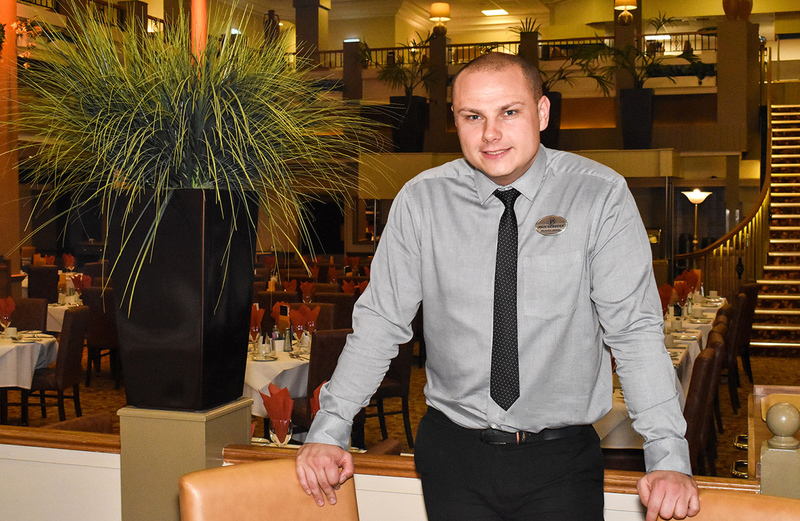 We know from feedback that guests value our lovely waiting team on Resort as much as we do, so we caught up with our Restaurant Manager John Nemecek for a chat. How long have you been at Potters? This is my 11th year at Potters. I started on the bars which I worked on for five and a half years as a bartender and worked up to bar senior supervisor. I moved over to the restaurant and became assistant restaurant supervisor, then got promoted to restaurant manager. I look after the smooth running of the restaurant team and service, plus rotas, appraisals, training and new initiatives and ideas too. I’ve been with Potters a long time, but I still love what I do. Our team do an amazing job looking after guests daily and deliver fantastic service. As well as the friendliness of the team, it’s also the quality of the food. The team serve over 700 people a day and in the Summer this goes up to 800. There’s around 36 members of staff on each shift and we have around 75 members of the team in total. Guests love that they have the same waiter or waitress for the duration of their break and that they have the same table throughout their break. We get great feedback from guests on the team, who say that some of the team made their holiday. Guests enjoy four meals a day. What challenges does that have? The ‘midnight dish of the day’ is self-service, but we set everything up for that and the bar team help us with this. It can be challenging when all the guests walk in to eat at the same time, but the team is ready and prepared for this. Restaurant is one of the biggest departments on Resort and there’s around five in the management team. There’s split shifts as we serve breakfast, lunch and dinner, but we all work together and get on really well. It’s a big operation but it is still so personal and friendly, and is just a wonderful place with a friendly atmosphere. The guests are lovely and there are opportunities for staff who work hard. It’s varied and I really enjoy my job. What’s your favourite Potters meal? That’s a hard choice, but the lamb shank is delicious. What meal do Potters guests request more than anything else? Fish and chips always get requested and 70 per cent of people have this when it’s on the menu. The classic dishes are always very popular. What’s your favourite time of year at Potters? Summer, although it’s one of our busiest times, has a really relaxed atmosphere when we have families on Resort. Everyone has a lot of fun and we have lots of menu items for kids, and can cater for the most fussiest of eaters. How closely do the restaurant team work with the chefs? We work very closely together and training consists of two weeks with the chefs, so that their job and challenges can be understood. We also pass on feedback from guests to the chefs on a regular basis. How often do you train staff? It takes a special kind of person to work in front-of-house roles and we are lucky to have such a talented and friendly team, who are efficient, attentive and build up a good rapport with guests while they are with us. The feedback we receive from reviews and awards on TripAdvisor is testimony to just how much our guests value them too. I’m responsible for learning and development and I’ll sit down with other management to look at how we can deliver and recognise training needs. We have regular training, especially when there’s a new menu or new wine list. The chefs will cook up the dishes for the staff to try and taste, and tell them what’s in it and allow them to ask questions. We have a really friendly team and some of the team have been at Potters for 17 years and many around nine or 10 years. Are you critical when you dine in other restaurants? Yes, but I probably wouldn’t complain unless the food was really bad. It’s funny as I was out recently and saw some empty glass and automatically went to pick them up as it is just a force of habit. I do observe the quality of the service though when I go out. Do you cater for vegetarians and people who are gluten intolerant? Yes, and we ask the Reservations Team to ask questions like that when booking. We have a lot of different requests that come through and the chefs work hard to facilitate them, and they will even talk to the guest at breakfast to show them their suggested menu for the rest of the day, so that they know it is suitable for them.